The 'Aratea' is so-called because is Cicero's latin translation of a poem on the constellations by a 3rd-century BCE Greek philosopher named Aratus. An essential text to medieval theologians and astronomers, it was usually accompanied by other astronomical treatises, as it is in this manuscript, because a knowledge of the heavens was necessary for calculating the dates of Easter and feasts depending on it. Moreover, it was nearly always illustrated, having a tradition of illustration drawings in which the stars are shown as red points. This is one of the most beautiful copies of the book. It was made at Fleury, but an English artist made the illustrations. The very fine drawing with its subtle shading and liveliness of line is typical of the best art of the 10th- and 11th-century Anglo-Saxons. Some of the pages have one constellation, others two. 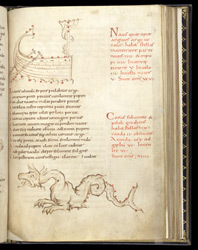 The Great Ship Argo (Argo Navis) and the Whale or Sea-Monster (Cetus) share a page. The poem itself is written in black, while the writing in red gives the number of stars in each part of the constellations and their total number. The grouping of the stars of Argo sets out the smaller constellations making up the ship.